You have wide-ranging interests and influences and therefore appreciate a mix of styles, periods, and objects. 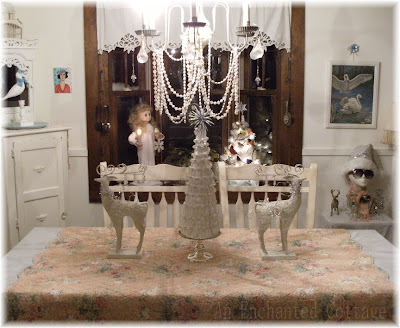 You would never use a matching suite of furniture or could stand a home that seemed cookie-cutter. ... and the happy florals of English cottages. 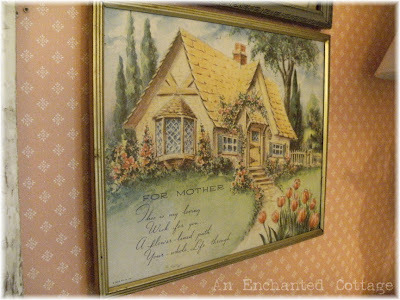 Well, this vintage floral cottage mother's motto is one of my favorites! So far they've got me pegged. 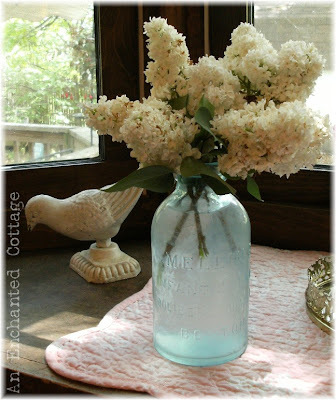 ...urns filled with tennis rackets, colored glasses filled with cut flowers, vintage-looking, mixed tea cups, and all things that give a sense of a happy, simple life. and you feel happiest when everyone is cared for and relaxed in your space. Spotty can vouch for that! 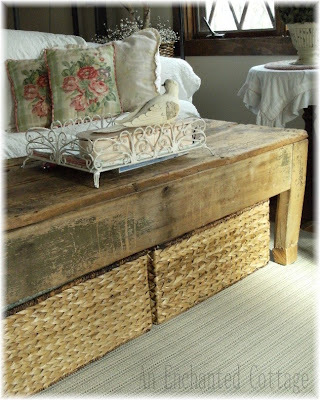 ... and vintage chenille throws for winter. Is anything more inviting than an overstuffed chair paired with a "free by the curb" reading lamp? Okay, Mary Higgins Clark, I'm ready for your next book! 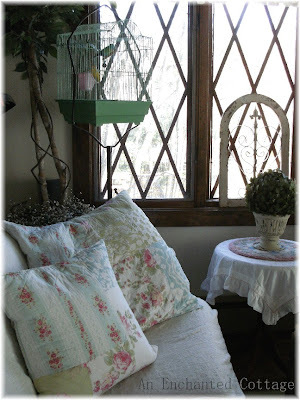 You may also enjoy layering different fabrics or mixing patterns to create a cozy effect. Click here if you'd like to take the HomeGoods Stylescope quiz created by Deborah Needleman, editor-in-chief of Domino magazine. 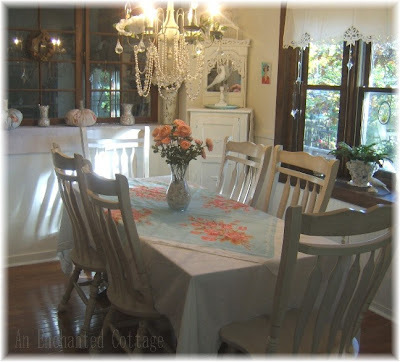 The results of my quiz perfectly matched my decorating style, Country Eclectic... So what's your style? 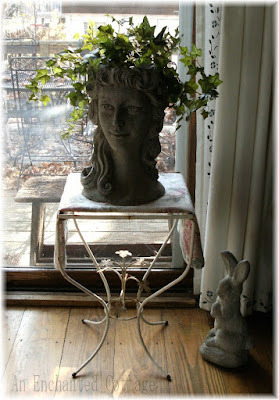 COMMENT RESPONSE: Patience, my lady planter, was purchased a couple of years ago from The Christmas Tree Shop. 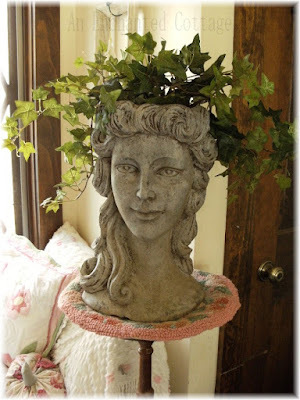 She was a dark brown/bronze color and I sponge painted her light grey to look more like a cement planter. 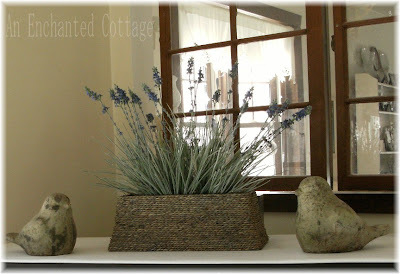 Ironically, that same year (after purchasing Patience) I saw very similar planters at HomeGoods!!!!! 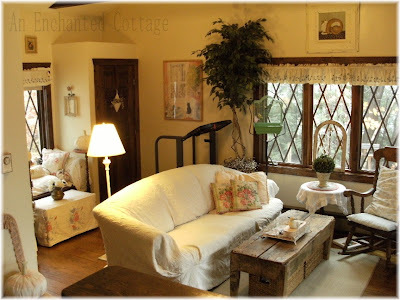 Donna, I love seeing photos of your home. 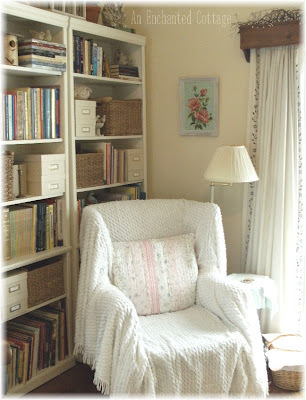 I always feel I could just drop by and plop down in one of your wing chairs! It is cozy and warm. I have a feeling I will also be a Country Electic - but haven't taken the quiz yet. But now I'm off to do just that! 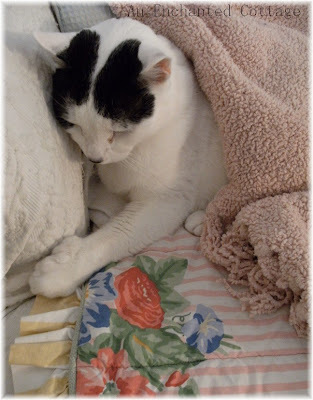 I have always, always loved your home, sweetpea. Especially the windows. But you are right on with your decorating. It certainly looks like "love decorated your home"! Donna, once again, it was a treat "visiting" your home! You certainly have a great style, full of comfort and interesting and quirky items, too. You really know what you're doing! I love your pics, but you must tell me where did you get Patience? She is so cute. Love your home and can't wait till mine has acheived what yours has! Home Goods is my hands down favorite store!!! I'm off to take the test but boy oh boy it sure had you down! I wonder what it will say about me. I'll have to go check. I love Home Goods. There is always something there that tempts me into buying it. I will be adopting a kitty soon!!! We don't have a Home Goods! And everyone seems to find such great stuff there. I think I'm sort of like you, although I'm going to go take that test. Funny, I live in a garden home, and my neighbor/friend down the street has basically the same layout as my house, but hers is more formal. I don't think I'd feel comfortable in a place where my pets couldn't be where they want to be! Which is on the furniture! I like your style, girl! You have a "comfy" house. That was mine too! You did a better post though. 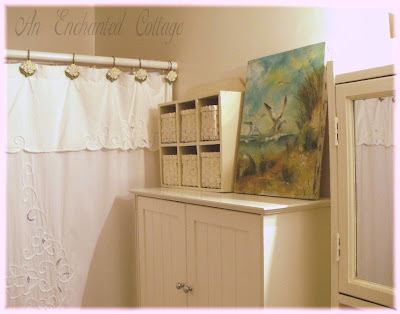 Love how you show your home! Love your look and style. We don't have a Home Goods here, but I'm off to take the quiz. Thank you so much! Your home is beautiful and I liked the post and how you showed how the quiz really related to you. Your home is such an inspiration. So beautiful! It should be in a magazine, and you could do your own photos! I just love the welcoming feeling that comes across. I think that's true too! Enjoyed visiting your home. I like your throws on the furniture. Very cozy home. That quiz is almost scary in its accuracy isn't it? Your home is so warm, inviting, and your hard work is evident in all you have shared. Thanks for the glimpse of your home! I love your home! 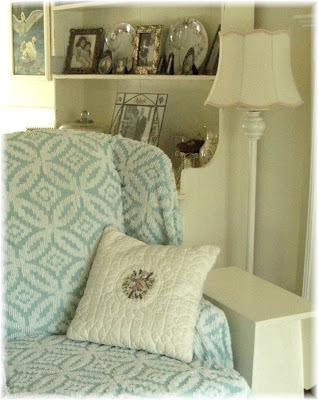 Love chenille too! Pillows YES! I took the quiz and I'm "country eclectic" too. 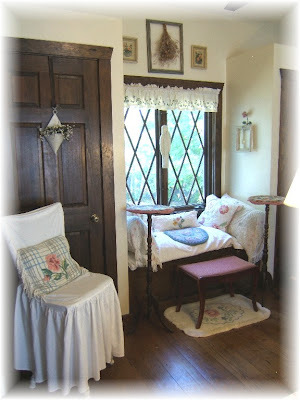 Love how you decorated your house... so cozy and picturesque. Glad I followed the blogher link- worth a second look. Whatever they want to name your style, I love it. It works. I especially love your pillows and all the shabby white furniture. Very nicely done. Oh and thank you for the great idea... 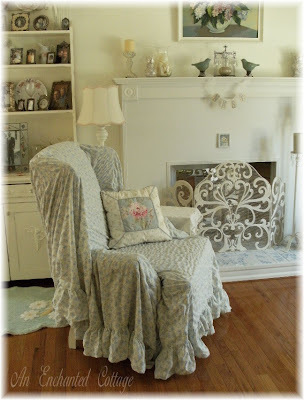 Using throws on wing chairs! 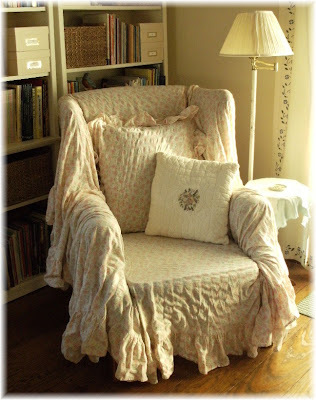 We have a wing chair that so needs a re-do. But I just won't spend the money on upholstering it. But! Wow! A throw!!!!! The college apartment - pink & green!